I usually do not buy cookbooks without taking a look inside their pages first – I have done that in a few occasions and got really disappointed; but after reading the reviews for "Sarabeth's Bakery: From My Hands to Yours" and seeing a photo of one of the cookie recipes I felt I would love the book – and I did. It’s full of great recipes, beautiful photos and there are several recipes for preserves, which is something I intend to make more often – especially after tasting this cherry-plum preserves, which is one of the most delicious recipes I have ever made. 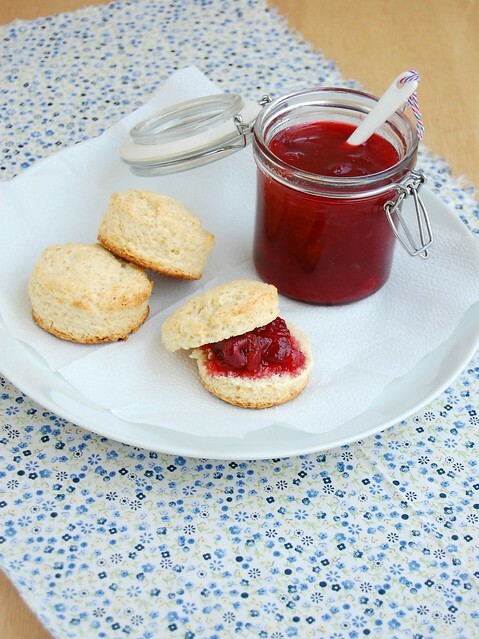 I am sure the preserves would work beautifully over some panna cotta or served along a slice of simple pound cake or angel cake, but I went the traditional way and baked some scones to serve with it. Fantastic combination. Combine the cherries, plums and orange juice in a non-reactive large saucepan. Bring to a boil over high heat, stirring often. Reduce the heat to medium-low and simmer, stirring often, until the fruit is tender, about 15 minutes. Stir in the sugar and lemon juice and return to a simmer. Cook, stirring often, until the fruit has fallen apart into a thick, chunky puree, about 20 minutes – the plums dissolved completely and the cherries remained in pieces. Let cool completely, store in jars and keep in the fridge. Preheat the oven to 200°C/400°F. Line a baking sheet with baking paper. Combine the flour, baking powder, sugar and salt in a medium bowl. Add the butter and use your fingertips to work it into the flour mixture until it resembles fine breadcrumbs. Use a flat-bladed knife or a fork to mix in the milk until the dough is soft and sticky. Knead the dough lightly on a floured surface and press into a round approximately 3cm (1.2in) thick. Use a 5cm (2in) plain cutter to cut rounds and place onto the prepared sheet. Brush the tops with milk and bake for 15 minutes or until risen and lightly golden. Serve warm with the preserves. I was thinking to buy Sarabeth's Bakery book, but not sure do it because I also like to review pages before buying, I like when cook books have pictures on each recipe. Now I know I have to include it in my list, so thanks. By the way, love the scones and of course, the preserve. The cherry-plum combination sounds delicious. Do you know how long the preserve will keep in the fridge? Nothing will beat the homemade preserves..
Patricia, this looks so good. I was wondering, if you got a minute, would you like to link this recipe up to my second "Thriving on Thursdays" Linky party here in Australia? I know a lot of my readers would love to see your recipes. Tutti Dolci, I'm not sure how long it lasts, but I would guess 1 month, easily.